The following intelligence assessment was originally reported on earlier this month by CNN, which did not release any portion of the document. The complete assessment was released by Reason magazine on February 25, 2015. (U//FOUO) This Assessment is based on an I&A review of 24 law enforcement investigations into acts and threats of sovereign citizen extremist (SCE) violence since 2010, detailing locations, targets of violence, and their statements about the violence, when available. It is intended to inform law enforcement at the federal, state, and local levels about the nature and circumstances of SCE violence to help officers prepare for, anticipate, and ultimately avoid violent incidents. Most sovereign citizens are non-violent, and this assessment applies only to those that use violence to advance their goals. 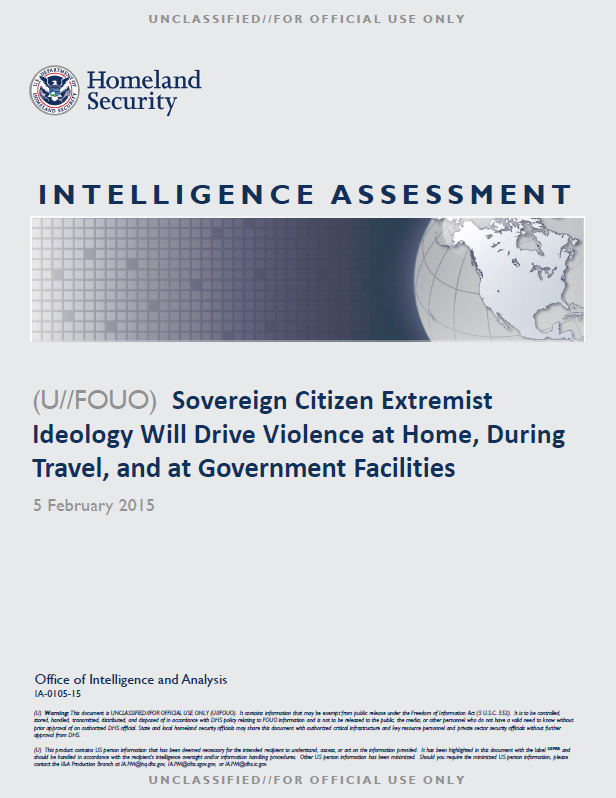 This Assessment stems from law enforcement feedback on a 2013 analysis of the geographic distribution of SCE violence (see “(U//FOUO) Limited Reporting Suggests Sovereign Citizen Extremist Violence Most Common in Southern and Western United States,” dated 27 February 2014). (U//FOUO) For this review, I&A counted only violence perpetrated by identified SCEs for ideological reasons that involved shootings, assaults, plots to commit violence, and credible violent threats against law enforcement, government personnel, and public officials. All incidents were reviewed by multiple I&A analysts to validate ideological motives. This data set may not be comprehensive of all SCE violence and threats of violence, and is limited by the difficulty in discerning the ideological motivations behind some crimes, which could increase the number of violent incidents by SCEs that were not recognized or reported as stemming from ideological reasons. Additional information from state and local partners could assist efforts to better understand the nature and breadth of these activities. (U//FOUO) I&A assesses that SCE violence during 2015 will occur most frequently during routine law encounters at a suspect’s home, during enforcement stops and at government offices. (U//FOUO) I&A assesses that SCE violence over the next year will remain at the same sporadic level, consisting primarily of unplanned, reactive violence targeting law enforcement officers during active enforcement efforts. (U//FOUO) I&A assesses that most SCE violence will continue to occur most frequently at SCE homes, during routine traffic stops, or at government offices due to their perception that their individual rights are being violated. SCE violence took place in these three circumstances in 19 of the 24 instances of SCE violence since 2010. SCEs perceive that law enforcement efforts and judicial actions infringe upon key personal rights and individual sovereignty—such as the right to travel—most strongly during these circumstances. SCEs believe they personally can ignore laws and act according to their own sovereign citizen ideology. Consequently, when SCEs perceive government representatives directly infringing on their rights and freedoms in an irrevocable way—such as police serving a warrant or a judge ruling against legal filings intended to tie up court proceedings—SCEs resort to violence. (U//FOUO) I&A assesses that SCE tactics differ from most violent extremists in that their attacks are reactive and personal, rather than symbolic. Other domestic terrorists typically attack symbolic targets to oppose laws and policies they disagree with rather than certain individuals. By contrast, even when SCEs plot their violence over time or threaten attacks, it is often in direct response to an ongoing personal grievance, such as an arrest or court order. In almost all of the 24 incidents we reviewed, the targets were the specific individuals who the SCE perceive violated their rights, rather than public symbols or anonymous representatives of the government. While other domestic terrorists may be motivated by personal grievances as well as ideology, rarely do they target a specific individual.